The methods we use in our building work go above and beyond the acceptable practices and tolerances in the Australian Building Industry. Why? Well, quite frankly we believe you deserve more than the standard. By going the extra mile to be more confident in the materials we use and more accurate in our building processes, we can guarantee that you will get more out of your home and more from your investment with us. To ensure your new home is built on a firm base, all loose fill is moistened, placed in 200mm thick layers and compacted with a pad foot roller. 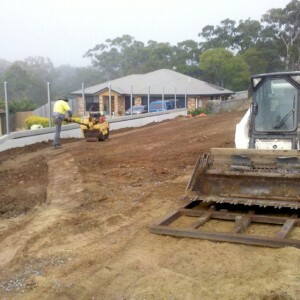 This process prevents any chance of subsidence (the gradual caving in or sinking of land) and goes beyond the standard practices of site preparation in Australia. Our experienced team of carpenters do all our formwork (setting up moulds for the slab), ensuring our slabs are accurate to within 3-5mm whereas the standard acceptable accuracy for this task is within 20mm. 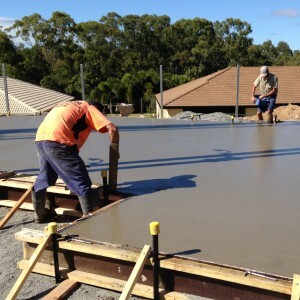 We also compact our granular fill prior to the concrete pour to prevent hollow spots occuring under the slab. All our subfloor timber (bearers and joists) are painted with 1 x coat of oil-based undercoat and 2 x coats of acrylic low sheen paint to prevent moisture penetration. All timber decking is precoated with Cutek decking oil before fitting (including cut edges) and all decking and joists are pre-drilled and countersunk with stainless steel screws. When it comes to installation of flooring in your home, all ply sheeting is glued and screwed into place. These methods are above standard practices for decking and flooring installation. For further information about Australian building industry standards, please download the following QBCC Guide to Standards and Tolerances. Find out more about Our Materials and Our Management.